A Wednesday Senate State Affairs Committee meeting proved to be ground zero for some good political theater as a fight between the snotty tone of the State Senate met the rare trash talking of the Governor’s Office. The meeting in Wasilla was called to hear testimony on the Governor’s priority bill (SB 50010) which reforms the structure of the Permanent Fund. Almost as soon as it began, Senators Charlie Huggins and Bill Stoltze repeatedly took turns with openly hostile and nakedly passive aggressive comments towards the Walker administration for not supplying more senior administration officials, such as Revenue Commissioner Randy Hoffbeck, to explain the bill to senators and answer their questions. 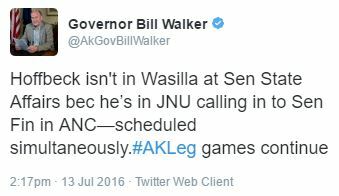 The games the Governor appears to be referencing is the apparent scheduling of legislative hearing(s) in a manner designed to cause the administration problems. 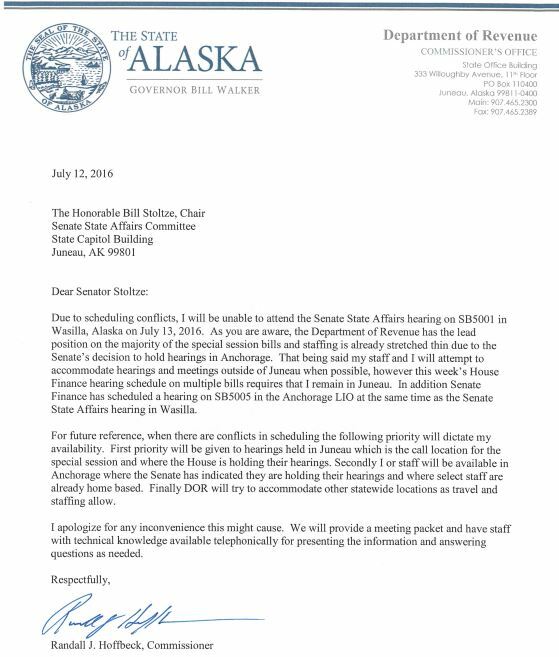 You see, the state legislature had scheduled hearings that day for the House Finance Committee in Juneau, the Senate Finance Committee in Anchorage, and the Senate State Affairs Committee in Wasilla all at the same time. As such, the administration was unable to provide senior officials to testify in all three. So why didn’t Stoltze and Huggins change the meeting to accommodate a crowded schedule? That is a good question and one they have yet to answer. 2 Comments on "Document Shows Walker Correct About Legislators Playing Games With Hearings"